Want to travel across the country? Journey with this RV, which boasts a hitch weight of 496 lbs. and a GVWR of 6496 lbs. Once you've reached your destination, place your camping chairs and picnic table under the cool shade and protection of the 18' 0" awning! All that traveling is sure to make you tired, so give yourself the best night's rest possible! You'll love sleeping on top of the cozy Queen bed in the master bedroom after a long day on the road. 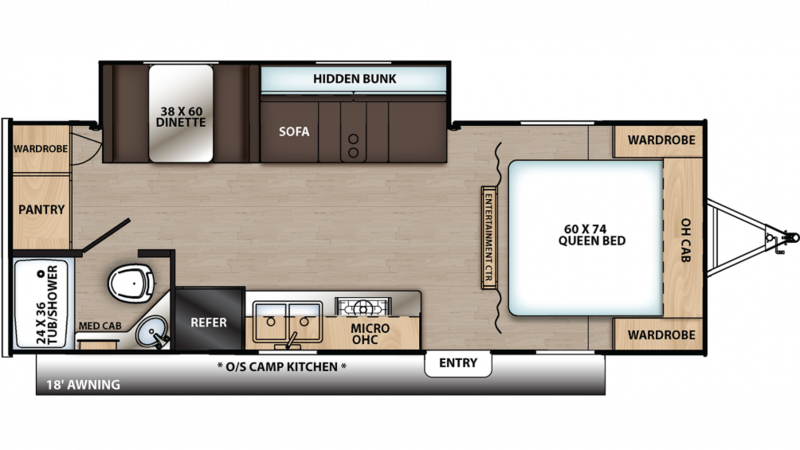 This spacious camper has enough sleeping space for up to 5 people! Cook up your favorite dishes inside the kitchen with the 3 burner range cooktop. Use the 7.00 cu. ft. refrigerator to store fresh food for the trip. The 46 gallon freshwater tank provides clean water throughout the RV. Like to start your day with a hot shower, a shave, or a wash-up? Then you'll love the great master bathroom with its roomy shower and convenient Marine Foot Flush toilet! And with the hefty 46 gallon freshwater tank and an LP tank capacity of lbs, there'll be plenty of hot water for everyone! Waste and used water are stored in the 32 gallon black water tank and the 32 gallon gray water tank, respectively.